Maybe you didn’t notice, but this is Snarky Puppy’s world, and the rest of us only live in it." 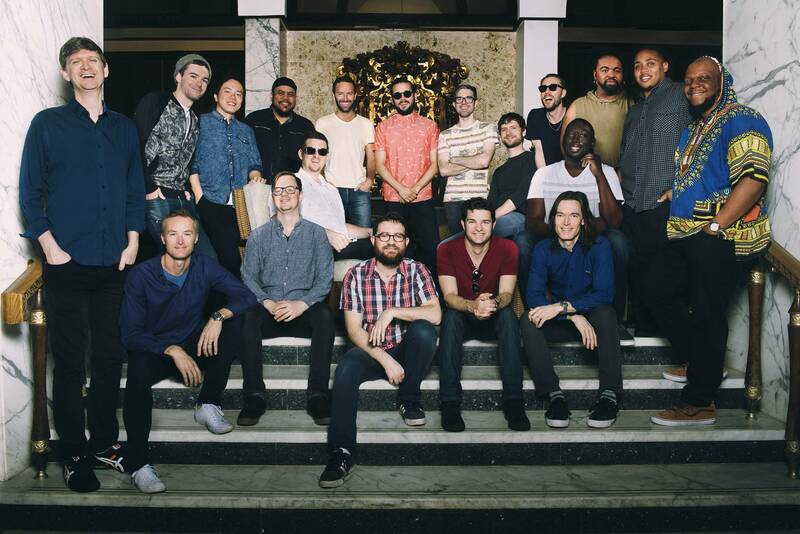 - The New York Times The last four years have brought dramatic changes for Snarky Puppy. After a decade of relentless touring and recording in all but complete obscurity, the Texas-bred/New York-based quasi-collective suddenly found itself held up by the press and public as one of the major figures in the jazz world. But as the category names for all three of the band’s Grammy® awards would indicate (Best R&B Performance in 2014, Best Contemporary Instrumental Album in 2016 and 2017), Snarky Puppy isn’t exactly a jazz band. It’s not a fusion band, and it’s definitely not a jam band. It’s probably best to take Nate Chinen of the New York Times’ advice, as stated in an online discussion about the group, to “take them for what they are, rather than judge them for what they’re not.” Snarky Puppy is a collective of sorts with as many as 25 members in regular rotation. They each maintain busy schedules as sidemen (with such artists as Erykah Badu, Snoop Dogg, and D’Angelo), producers (for Kirk Franklin, David Crosby, and Salif Keïta), and solo artists (many of whom are on the band’s indy label, GroundUP Music). At its core, the band represents the convergence of both black and white American music culture with various accents from around the world. Japan, Argentina, Canada, the United Kingdom, and Puerto Rico all have representation in the group’s membership. But more than the cultural diversity of the individual players, the defining characteristic of Snarky Puppy’s music is the joy of performing together in the perpetual push to grow creatively. The band was formed by bassist and primary composer Michael League in 2003, starting inconspicuously enough as a group of college friends at the University of North Texas’ Jazz Studies program. Three years later, a serendipitous intersection with the Dallas gospel and R&B community in Dallas transformed the music into something funkier, more direct, and more visceral. It was at this time that the group absorbed musicians like Robert “Sput” Searight (drums), Shaun Martin (keyboards), and Bobby Sparks (keyboards), and were heavily influenced by legendary keyboardist Bernard Wright (Miles Davis, Chaka Khan, Marcus Miller).